I often refer to our youngest daughter, Chloe, as "mini-me". She kinda looks like me (poor girl), has my mischievous personality (another strike), and shares my affinity for making things. In fact, when asked, she will emphatically tell you that she wants to be a carpenter when she grows up. Her maternal grandfather is a retired construction superintendent, so that one ain't on me. A few weeks ago Chloe came to me with this tiny little covered tin and asked if we could make a grill out of it. Ironically, earlier that very week I had run across this in my daily RSS reading. The tin she showed me was maybe two inches in diameter. She was sure that it would be a cool little grill, but my pragmatic mind begged to differ. I thought something a little larger, but still "mini" was clearly in order here. As much as I tried to sell Chloe on the idea, she thought her tin was all that, and a side salad. This obviously called for a mission. I scoured our area for something bigger, but not too big. It seemed that I would be denied, until I wandered into the local Tuesday Morning store. There I found these perfect little stainless steel bowls. They are about six inches in diameter and about three inches deep. They were clearly perfect for "The Mini-Grill". The next order of bidness was to find some legs, grate material, and the necessary hardware. Home Depot was on the way home from Tuesday Morning, so in I went. I picked up some six-inch carriage bolts, washers, nuts, and expanded metal. Our eldest two girls were out of town at Girl Scout camp that weekend, so Chloe and I built this bad boy in our own time. We measured, cut circles of cardboard for templates, measured some more, and then it was time for the fireworks. I donned my protective glasses and ear muffs, plugged in the angle grinder (at dusk, of course), clamped the expanded metal in the Workmate, and let 'er rip. When the sparks settled, we had expanded metal charcoal and cooking grates. After sanding the rough edges from the grates it was time to punch some holes and assemble this bad boy. We measured and marked some more, then drilled, then drilled some more. Finally, we put it all together. There was much rejoicing. Chloe was basking in the glow of "The Mini-Grill", and her sisters were nowhere to be seen. We have yet to fire up "The Mini-Grill", but somehow that's secondary now. It was a great daddy/daughter project. Stay tuned for the maiden cook. Aw, such a lovely story! Your daughter is very lucky to have you for a father. And the grill is simply adorable and very, very well done. She will remember this forever!! Very pleasant story and hope to make memories like this one day when I have children. Grill looks great! Hope it cooked well. 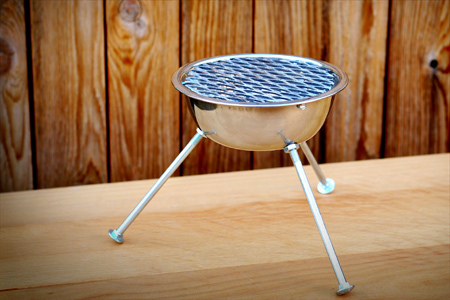 now all you need is a second bowl, more nuts and bolts and you can build a lid for the mini-barbi to do a little smokin or covered bbq. Oh i love this one, it reminds me of a portable charcoal grill which is really convenient when you go travelling. There is something called a giant electric blower which can create fire, so its not difficult at all if your daughter want to fire the smoker herself.